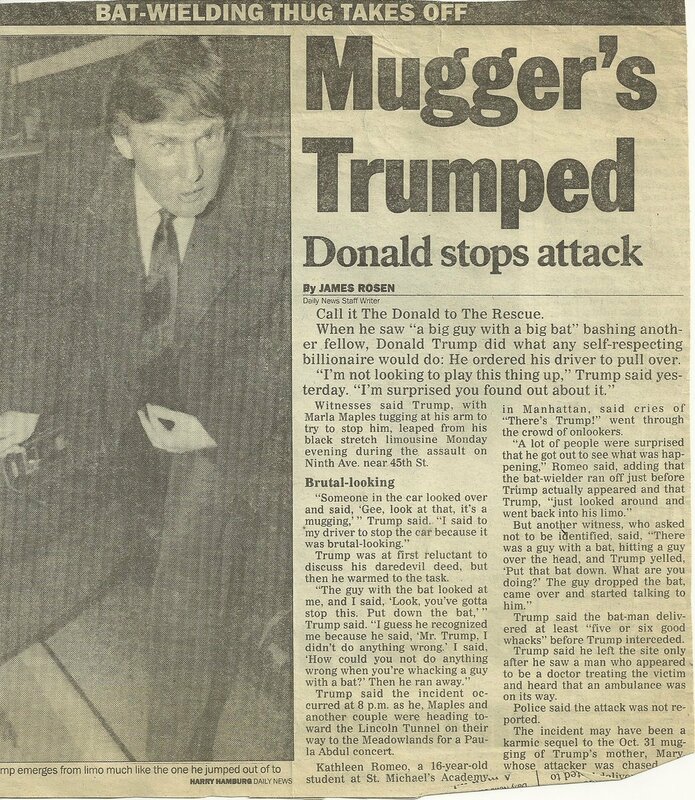 Long before he was president, Donald Trump once stopped a man armed with a baseball bat in the process of mugging someone, according to news reports. The 1991 incident gained new attention Tuesday after Trump commented that he would run into a school to confront a shooter, even if he was unarmed. Trump was criticizing reports that the sheriff’s deputy stationed at the Stoneman Douglas High School who did not enter the building during a mass shooting where 17 students died Feb. 14. The New York Daily News reported that as Trump was riding in his limousine on Nov. 18, 1991, with his then-wife Marla Maples (on their way to a Paula Abdul concert), they came upon the mugging. Trump got out of his car and approached the man with the baseball bat. Trump said the attacker, “a big guy with a big bat,” delivered five or six “good whacks” before he arrived at the scene. The incident wasn’t reported to the police, and one witness disputed Trump’s account. “A lot of people were surprised that he got out to see what was happening,” Kathleen Romeo, a student at the time, told The Daily News. She claims the man with the bat ran away just before Trump got there. Trump then “just looked around and went back into his limo,” Romeo said. The story is still on the archives of the Philadelphia Inquirer and multiple screenshots are available online, and it’s has been reported multiple times since it resurfaced in 2016.